Roughed up in the ‘burbs. 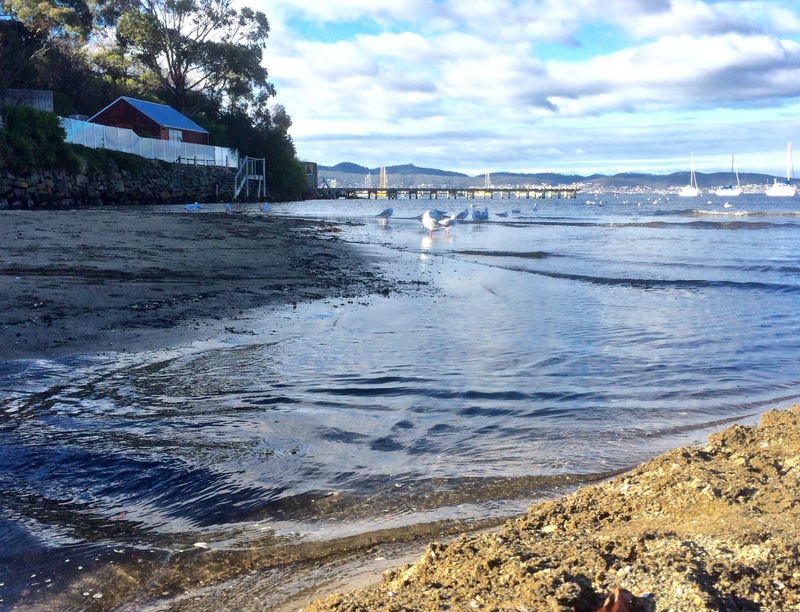 South Hobart, Dynnyrne, Sandy Bay – the suburban route began with a nondescript path outside the park gates that ran downhill to the rivulet, returning in a rush to its natural bed. I explored a bit, then crossed it to reach the forest track above it through to Romilly Road. So here’s the sobering truth. 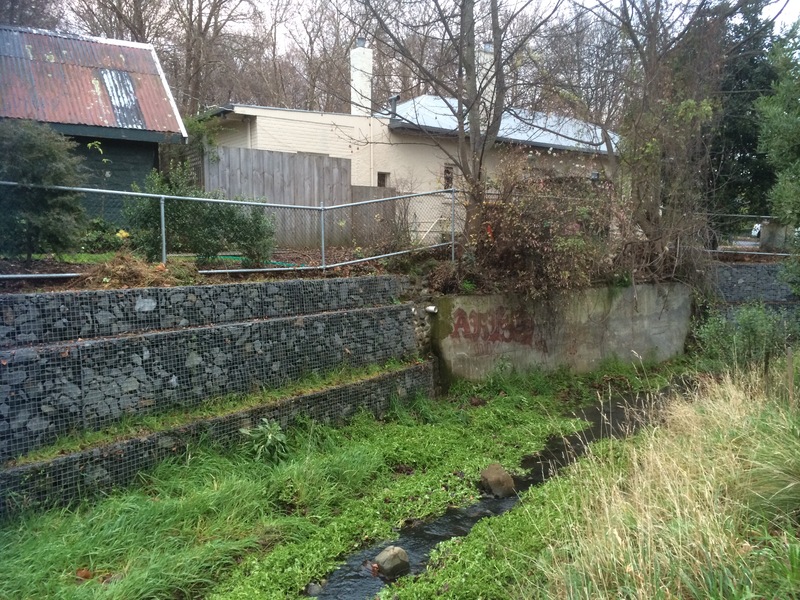 The houses begin and the rivulet gets roughed up. A sign of worse to come, it travels between banks entangled with blackberries and forgot me nots, lawns and paddock. Some gardens make it their focus, others shun it. Regardless, it sounded almost cheerful flowing thin and narrow at this interface between forest and habitation. 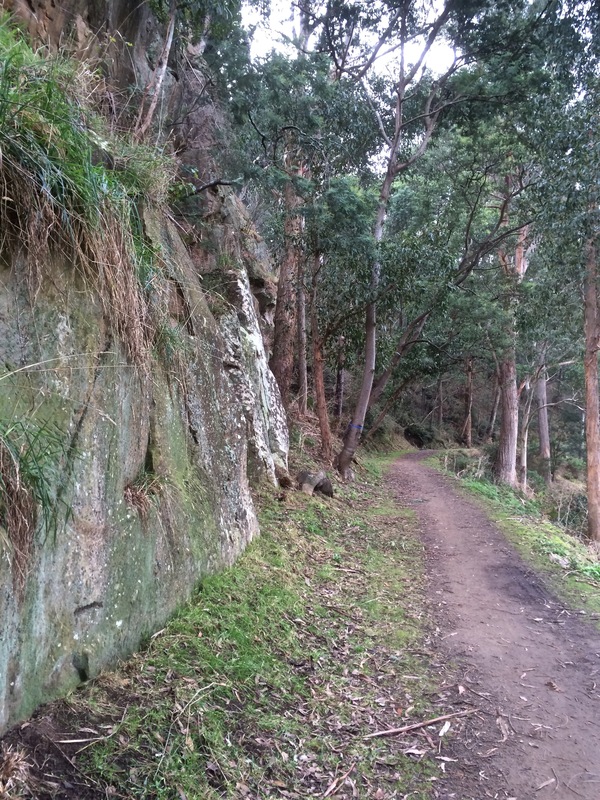 I had a good view of the state of affairs; this path follows a higher contour just below Stony Steps, another of Hobart’s secret places. There were cliffs; I reflected on how this rivulet, eons ago, before its landscaping capacity had been thwarted by us newbies, had carved an impressively deep valley. I arrived at Romilly Street. After my wanderings the concrete seemed cold, shadowed and unforgiving. I, myself, mentally immersed in the rivulet, felt out of place as I paused to take some photos from the bridge. I could see no way of getting to the bottom. It was the domain of the ducks. You barely catch a glimpse of the rivulet on the last stretch of Waterworks Road and what you see is hardly edifying. By the time it gets to Linton Avenue it looks scruffy and unkempt – and then it’s gone! it simply disappears beneath the road. With a sense of anticipation, I took the little path I’d discovered at Linton Avenue on a previous sortie, full of anticipation that I would burst through into the park but my conjecture was wrong. It led me through to an enclave of flats. Back on Linton, I peered through a wild tangle of tall, dense brambles and weeds, a sign of neglect that indicated a rivulet could well be travelling underneath. 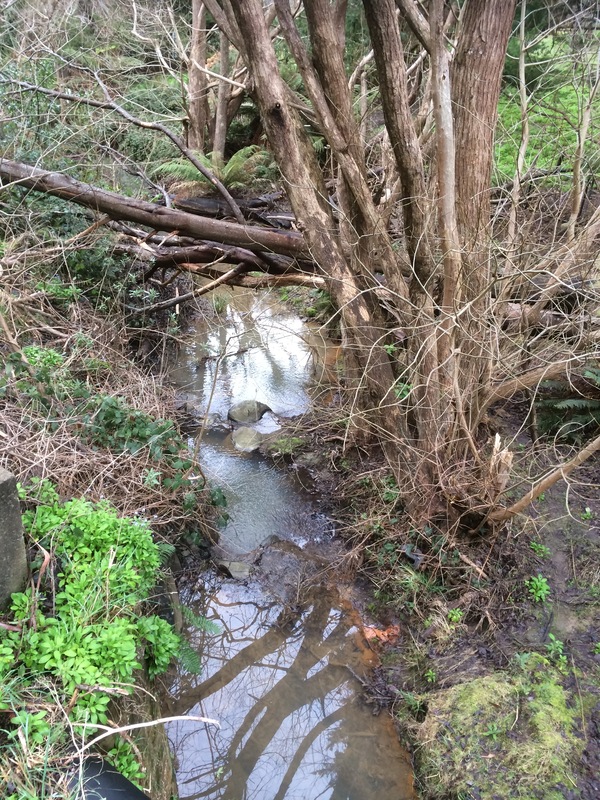 There was nothing to see, nowhere to go and so at the Foodstore on King I turned into Overall Street, braving a soapy smelling periwinkle clad bank, down to the rivulet, where I stood over it taking photos of where it emerges from its tunnel and its route down through the park. Then I chose to walk the road rather than that sodden weed infested bank and encountered it at Parliament Street where it travels beside the oval. I was retracing my steps from a brief exploration of this area the previous week. That morning frost had crunched under my shoes as I walked upstream along the rivulet flowing between gardens and park. I’d tiptoed past a tiny tent in a hidden glade (someone sleeping rough) and had expected to emerge on Linton Avenue but had arrived, instead, on the freeway, quickly ducking back down lest I be noticed by the morning traffic. Again I crossed the road. There was the place where I’d stopped to chat with a man who directed my attention to a house, once a mill, on the banks of the rivulet, and there again, down a steep descent, was the end of Fitzroy Place and the woebegone rivulet now in a stormwater drain heading beneath Regent Street. I sauntered down Queen Street and detoured into Lincoln Street to meet it again where the story was one of ducks and daks – ducks fossicking on the bank and old underpants caught on a rock. I walked down Jersey Street and found the rivulet carrying a plastic bag. 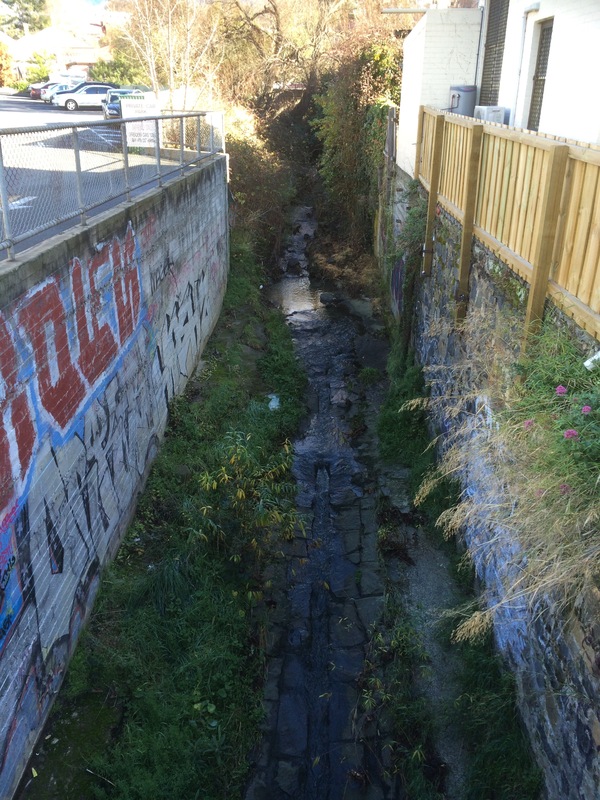 I was there to greet it at Dr Syntax, where it had accumulated plastic cartons and I was there as it entered another stormwater drain (yep, we really esteem this rivulet) and was there to witness it running down its gutter behind the back gardens on Osborne Road. Sombered, I headed down Quayle Street. 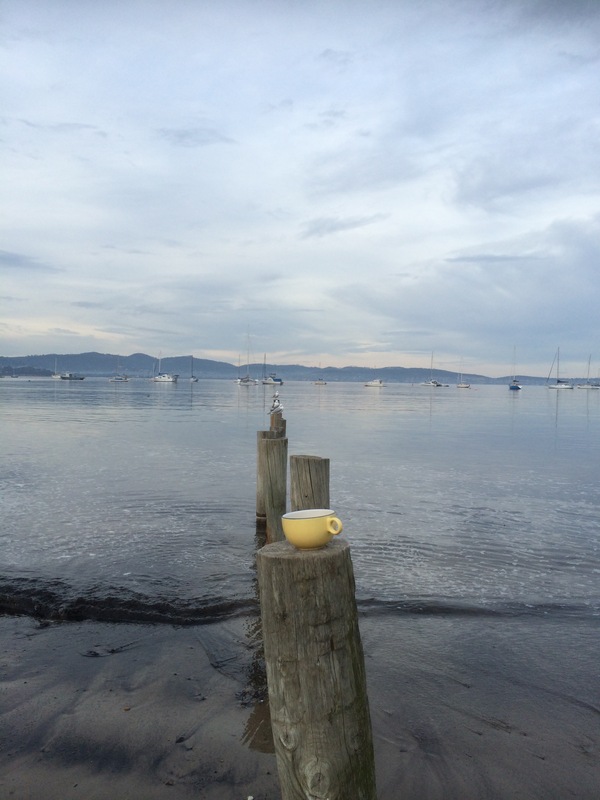 Down near the beach the rivulet gets some recognition but litter marrs the scene – spray cans, McDonalds takeaway products, trapped by a buffer – Mary Ann Bay Beach is grateful. What a terribly filthy, crass minded species we are, I was thinking, and then a welcoming tide came rolling in, and the rivulet, once fragrant, now toxic, depleted itself into the Derwent. My dogs rushed to greet me and the geologist waited. Short Beach was lit with slow afternoon activity and the light was mellow. Feeling like a traveller arriving in another land, I was both buoyed by the loveliness of the walk to Romilly, the activity on the Esplanade and sobered by how quickly the rivulet had been ravaged. We found a bench, we spread a cloth, we poured puerh tea, and sitting side by side eating chocolate and imbibing this smooth antique tea, I told the geologist of the places I’d been and the things that I’d seen. Thanks, I’ve enjoyed your walk. 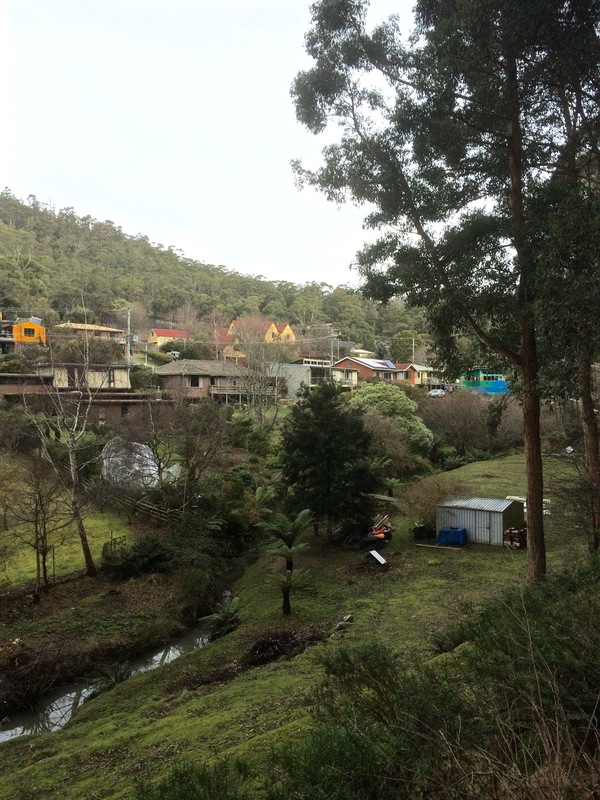 New Town Rivulet seems to have fared better than yours – it’s possible to follow that pretty much all the way from mountain to sea. Thanks, No Visible Means, it really engrossed me. New Town is pretty lucky although it’s been diverted into the Maypole Rivulet (or vv) I think. My hunches are often wrong – but I plan to find out in due course.